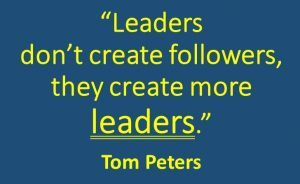 This quote by American writer on business management Tom Peters has been a guiding principle (and caution) throughout my career as a school librarian. I firmly believe that all school librarians can/must/will/should aspire to leadership in their schools—and in the profession. Through instructional partnerships, curriculum design, collection development, resource curation, and participation in our national association, there are limitless opportunities for leading. When I taught at Texas Woman’s University, graduate students who participated in a course called “Librarians as Instructional Partners” developed a Web 2.0 portrait of themselves as a collaborator. As an exercise in getting to know their styles, students took the Jung typology test (Myers-Briggs). They also took the (Gary) Hartzell Needs Assessment that focuses on the relative strength of one’s need for achievement, affiliation, and power. I taught 12 sections of the course over a period of 7 years. In all but one section of this course, the “introverts” far outnumbered the “extroverts.” In terms of percentages, 60 to 80% of the students taking this course identified as “introverts.” Barbara Shultz-Jones, associate professor at the University of North Texas, and I compared notes on this phenomenon more than once. Likewise, she found that a majority of her students also identified as introverts. Yes! to introverts. I married one; my son is one… And I don’t believe those designations are black and white. People who are introverted in some situations may behave as extroverts in other situations and vice versa. The same can be true of risk-takers, innovators, and leaders, too. Long-time school librarian, librarian educator, and leader Hilda Weisburg titled her hot-off-the-presses book Leading for School Librarians: There is No Other Option (ALA Editions 2017). I am in total agreement with Hilda. As she notes, school librarians’ “ultimate survival rests on their ability to be recognized as a leader in their building” (xvi). There is NO other option. Absolutely! Rather than can they, the question may actually be will they. Will the members of a predominantly introverted profession connect their passions for literacy, literature, and libraries in such a way as to step out of their comfort zones to lead? I believe they can and will, and as Hilda says, I believe they must. In October, 2016, the American Association of School Librarians (AASL) released a study conducted by KRC Research: “AASL Member and Stakeholder Consultation Process on the Learning Standards and Program Guides” (2016). The study involved 1,919 respondents involved in school librarianship who took an online survey. Approximately 40 people participated in six focus groups conducted at the 2015 AASL conference, and 110 participated in focus groups held around the country at state conferences. Of the core values most frequently mentioned by participants in the focus groups, fostering “leadership and collaboration” was 9th out of ten values (9). 1. Leaders work smarter, not harder. 2. 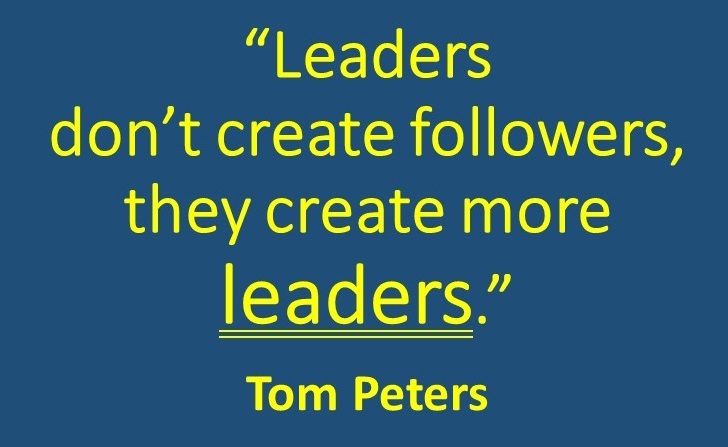 Leaders have all of the answers. 3. Great leaders are always in the spotlight. 5. Leaders are born, not made (Walter). Now is an important time in the history of our profession to marshal our courage to lead. Yes, we will need to work hard. Yes, it’s a relief to know that we don’t have to have all of the answers, be always in the spotlight, or always be “on.” And most importantly of all, leaders can be made. We can become the leaders our students, colleagues, and profession need to be instrumental in transforming teaching and learning. We can be future ready librarian leaders serving our learning communities through future ready school libraries. And through collaboration, we can help create leaders among our students, colleagues, and in the larger school librarian and education communities! American Association of School Librarians. “AASL Member and Stakeholder Consultation Process on the Learning Standards and Program Guides.” American Library Association, Oct. 2016, http://www.ala.org/aasl/sites/ala.org.aasl/files/content/guidelinesandstandards/AASL_SG_ResearchFindings_ExecSummary_FINAL_101116.pdf Accessed 24 Mar. 2017. _____. Empowering Learners: Guidelines for School Library Programs. Chicago: AASL, 2009. Walter, Ekaterina. “5 Myths Of Leadership.” Forbes, Forbes Magazine, 8 Oct. 2013, www.forbes.com/sites/ekaterinawalter/2013/10/08/5-myths-of-leadership/#ddeb989314ed. Accessed 24 Mar. 2017. Weisburg, Hilda K. Leading for School Librarians: There Is No Other Option. Chicago: ALA Editions, 2017. 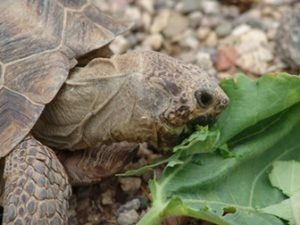 What does a Sonoran Desert tortoise have to do with a twitter chat? Thanks to Aesop, tortoises have a reputation for being “slow but steady.” Online professional development (PD), particularly a “slow Twitter chat” may result in the slow and steady progress we all want to experience in our personal learning networks (PLNs). Online PD is a trend that meets the test of aligning with library and my personal values. The Web allows near and distant colleagues to get together in real time or asynchronously. We can share our questions and challenges, successes and missteps. We can interact with others with particular areas of expertise. We can respond to shared readings and current events. In short, we collaborate to expand our knowledge and improve our individual and collective practice. Twitter has become a go-to PD platform for many state-level, university-based, and independent groups of school librarians. Through regular contact with one another, participants in these chats “learn from one another, develop shared meanings through exchanging ideas and information, and enculturate one another into the ever-evolving profession of school librarianship” (65). Developing a strong PLN is one important way to stay current in the field and freshly energized in our practice. In the 2014-2015 school year, I had the pleasure of being a participant observer studying the #txlchat. This Twitter chat meets during the academic year on Tuesdays from 8:00 to 8:30 p.m. Central Time. Members post using the hashtag throughout the week as well. I set out to learn about the #txlchat culture and the value participants place on this online PD experience. The #txlchat cofounders and core group members have created a “democratic” context for the chat. They are committed to ensuring that participants’ voices are heard. Everyone I interviewed and those who responded to the survey noted the benefits they receive from learning from others and from sharing their knowledge and experience with the group. “@debramarshall summed up her experience this way: ‘I am a better librarian because of Twitter’” (68). Chats can also be an excellent way to get out a message and share resources. The AASL/ALSC/YALSA Interdivisional Committee on School-Public Library Cooperation is currently exploring the use of Twitter chats to promote school-public library collaboration and the toolkit we created. Currently, I am participating in the American Association of School Librarians (AASL) Supervisors Section (SPVS) book discussion. We are using the #aaslspvschat to discuss the book Switch: How to Change Things When Change Is Hard by Chip and Dan Heath. SPVS Chair Lori Donovan (@LoriDonovan14) is posting questions for our consideration over a five-week period. This is my first experience with an intentional “Twitter slow chat” and my first experience with a total focus on a shared book reading. I think the slow chat format will help us take time respond to the moderator’s questions, savor each other’s tweets, reply to one another, and reflect on our discussion throughout the course of the slow chat. Whether or not you’re a school librarian supervisor, check out the hashtag and check in to note how the discussion is progressing. This “slow chat” may be a model for a book study or other conversations with your PLN. Moreillon, Judi. “Building Your Personal Learning Network (PLN): 21st-Century School Librarians Seek Self-Regulated Professional Development Online.” Knowledge Quest, vol. 44, no. 3, 2016, pp. 64–69. This past weekend, Tucsonans and visitors to the Old Pueblo celebrated literacy at the ninth annual Tucson Festival of Books. Over 100,000 people attended the two-day festival. From infants to the elderly, future and avid readers from all backgrounds and with varying literary preferences enjoyed immersing themselves in the power of story and the critical importance of literacy in their lives. This year, I had the responsibility and pleasure of booking the storytellers and facilitating their performances at the Children’s Entertainment Stage. These performances were part of the Entertainment and Family Activities offered at the Festival. In chronological order, Elly Reidy, South Mountain Community College (SMCC) Storytelling Institute tellers, Antonio Sacre, More to the Story Entertainment, Joe Hayes, and Carla Goody shared their love of story and their talents to eager audiences of all ages. Elly Reidy and SMCC Storytelling Institute Tellers Mario Avent, Chantel Freed, Chrissy Dart, and Liz Warren shared stories from published traditional literature. Their stories spanned different cultures and their retellings reflected the personalities of the tellers. In addition to enjoying their live retellings, listeners could find their stories in the folktale section of their public and school libraries. Hurray for 398.2! Antonio Sacre, who told stories on both days, shared personal family stories some of which have become picture books or part of a short story collection. One of the overarching themes in Antonio’s tellings is the power of family storytelling, Throughout his performance, he asked listeners to connect with their own stories/memories. Antonio shared his stories in Spanish and English and gave listeners a humorous and heartfelt window into his experiences as a boy, son/nephew/grandson, and father. More to the Story Entertainment captured the attention and imaginations of the youngest TFOB audience attendees and their families. Through fairy costuming, song, audience participation, and magical moments they delighted their audience. Joe Hayes once again captivated his loyal audience and made new fans, too, with his Southwest-seasoned tales and stories from beyond our region. Joe said he enjoys telling stories that blend cultures. He told a Cuban story about a family of white herons in Spanish and English and wove a chorus throughout the telling that reminded listeners of the African ancestry of a majority of Cuban people. Joe reminded us that stories connect people of various cultural backgrounds to a shared humanity. C. A. Goody shared the story of her inspiration for her Charlie the Cat series, which now includes nine titles. Taking the point of view of Charlie, she recounted how a cat might experience various aspects of life. Written for third- and fourth-grade children, Carla’s stories invite readers to take up their pencils/pens/keyboards to craft stories of their own. 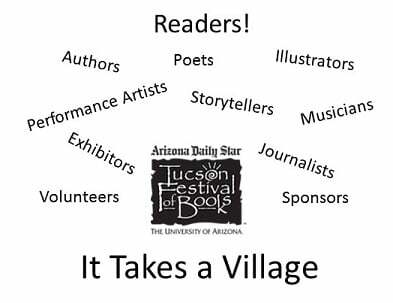 Thank you all for your part in making the Children’s Entertainment Stage an exciting part of the TFOB. As a former school librarian, (school) librarian educator, and family literacy advocate, I am keenly interested in the literacy organizations that support Tucson’s literacy ecosystem, particularly those that impact early childhood education. Make Way For Books: “Our mission is to give all children a chance to read and succeed.” MWFB serves more than 30,000 children and their families and 700 educators. It does take a village to support literacy and these organizations are doing vital work to elevate literacy in our community and improve the quality of life choices for our residents, particularly as they launch their literacy lives. Thank you to the presenters, sponsors, exhibitors, volunteers, and most of all the readers who use their literacy skills every day to enjoy life, to improve their life choices, and to participate in the life of our village, our country, and our world. In doing so, you are an essential part of the literacy village we all need. Bravo to all! This week is Young Adult Library Services Association’s Teen Tech Week (March 5 – 11, 2017). Just as Digital Learning Day is a snapshot of what should be happening in school libraries every day so are the learning activities that are being spotlighted this week. One thing that continually surprises me is that some people, new and practicing school librarians included, think that engaging students and supporting classroom teachers with Web-based resources and technology-infused learning experiences is something new in our profession. It’s not! Ever since the Internet entered schools, effective school librarians and progressive school libraries have been at the center of providing digital resources and services (in addition to reading instruction and literature-focused events and activities). New technology tools were a central feature in the school libraries where I served in the 1990s. Like many school librarian colleagues, I wrote grants to fund increasing technology tool access through the school library program. Also, similar to many colleagues, I convinced my principals that the central location of the library as the hub of learning in our schools was the appropriate place to provide equal access to all students, classroom teachers, specialists, and families. In 1992, our elementary school library was the first in the district to have a stand-alone and dedicated CD-ROM computer station. In 1994, I secured grant funding at another elementary school library in another district in order to provide the most “sophisticated” access to CD-ROM reference resources using a then “cutting-edge” server tower. In the summer of 1994, I facilitated a two-week summer technology camp for first through fifth-grade students to utilize the new software (HyperStudio) we had purchased for the library with grant funds. Fourth-, and fifth-grade students mentored first-, second-, and third-grade students and co-created exciting multimedia projects that would serve as samples for classroom teachers and other students during the following school year. In 1995, our school library facilitated the first student-designed elementary school website in Arizona. In 2000, when I served at another Tucson Unified School District elementary school, our school library website earned an Arizona Technology in Education Award (AzTEA) for the Best School Website; at that time, ours was the only site in the entire state designed, created, and managed by students. While I took a leadership role in all of these technology-centered initiatives, I most certainly did not do them alone. Business partners provided grant funding for soft- and hardware. The computer lab teacher I worked with in 1994 taught me most of what he knew about educational technology. He helped me select HyperStudio and an adaptor that transferred the computer screen to the TV screen; these tools literally transformed students’ learning and students’ and educators’ presentations. In 1995, a master’s in library science student intern taught me how to use website software and a bit about .html code; together we facilitated third-grade students’ design of our school’s site. Building on that experience in 1998 at a different elementary school, I formed a website advisory committee comprised of fourth-grade students, classroom teachers, a parent, and our principal and together we planned our school library website. Our goal was to put students in charge of the site. In 2000, we earned the AzTEA award mentioned above. All of these experiences taught me that collaboration and co-learning are essential in effectively integrating new technology tools into teaching and learning. Learning from and working with more proficient peers gave me the skills I needed and the confidence to take risks. I believe my own willingness to experiment helped classroom teacher colleagues stretch themselves and take risks alongside me. Being an adult learner myself, I was sensitive to their needs and characteristics as adult learners. Even more than the particular tool or project, it was my role as an instructional partner that helped us effectively integrate technology tools and instructional strategies into our shared curriculum. It was through coplanning and coteaching that I was able to serve as a change agent and helped diffuse technology and other innovations throughout our learning community. Technology stewardship has long been a responsibility of school librarians, and through classroom-library collaboration school librarians are positioned to serve as technology stewards who facilitate learning with technology in a future ready learning environment.